News, dispensed by my mother with a somber look, that Trinity Church would end the White Elephant Sale this weekend — after more than 100 years — gave me an inside out feeling. Like the clothes I would try on and off and let fall in piles at my feet when the chapel becomes the women's clothes department and the narrow hallway by the altar is the makeshift dressing room. The three-day sale has always been in May, just as the lilacs are blooming, drawing antique dealers and the biggest crowds on Saturdays. It's something I always thought was cool about being from Buffalo. When I lived in Maine, I used to drive back for the rummage sale with its mysterious name, and the retired Buffalo police officer with a ruddy Irish face who guarded the church hall entrance with affection. Just the mention of the White Elephant, to friends already in the know, then and even now, brings a conspiratorial smile. We know we'll meet up at the sale, swap cashmere in the wrong size and decide whether the designer suit is worth $10. For others who've heard me answer, "The White Elephant" a thousand times, I tried to use their compliments on my treasured finds — like my fuzzy purple mohair coat — as proof that they should take my advice: Come shop. The White Elephant is a couple levels of elegance beyond what you'd expect. The church basement and chapel get divided up like a department store with rooms for china, books, kitchenware, linens, children's, women's clothes. Lately, I've been explaining this more to people as I try to work out why the end is so sad for me. The old Delaware Avenue church with Tiffany windows, across from the Buffalo Club, had a blue blood reputation. Families who made fortunes in steel and factories took on charity projects to help the poor. The sale raised money and recycled and purged good old things that could still be put to use, like the prom dresses a city school worker bought last year for her students. Sometimes, it was as if I was buying some of old Buffalo's riches filtered down from the Pan American Exposition of 1901. For a dollar or two, I had my own monogrammed highball glasses, a tarnished silver cigarette box, linen towels with Fs and Ms embroidered in peach and appliquéd satin. Utilitarian whimsy gets me, too. When I make salads, I use a clawed scoop with "TOMATO SHARK" stamped on the handle to cut out stems. I found it in the kitchen department, long organized by my mother. As a child, I grew up going to two churches: a formal Catholic mass at Blessed Sacrament with my father, then with my mother, to Trinity, where things were looser and people mingled and ate coffee cake after church ended. As an adult, I'm not that religious. I rarely go to services. But I go to the Trinity White Elephant sale religiously. I try not to miss it even though I really don't need any more things. It's because of my mother that I appreciate its greatness. For as long as I can remember, my mother has been a volunteer, in charge of the "kitchen department." She recruits her friends, and starts months ahead of time getting organized — sorting all the coffee makers, food processors, flower vases, tea pots, old bottles, rubber ducks and other donations that somehow get classified as kitchen related. My mother has a formula for displaying the things in her department's basement room. The high-end stuff goes by the door so she can keep an eye on it and make sure it goes for the best price. She once saved a waffle iron — with a curly Q metal base — that she was convinced was one of the first of its kind ever made. Each year when it didn't sell at the "right" price — something like $10 — she packed it up and saved if for the next sale. Finally, one year, a guy came in, saw it, and paid her price for the broken down, but retro cool appliance with a frayed cord. My mother was happy. While my mother is busy haggling to get the best price, and cajoling people to buy more ("Look how light these wine glasses are," she told a customer. "That means they are good ones.") another familiar face at the sale has been a transplanted German who can be spotted patrolling the kitchen area. He's always looking for interesting old things, particularly from Europe, and even better if it's German. He once showed me a little metal sifter from his home country. I still haven't used it, but it's in my cupboard to remind me of him. I am stupidly fond of the white elephants, like that sifter, that litter my house. There's also the small blue Campfire Girl mug signed on the bottom by "Jd" in 1973. I don't know who JD is, but I know that my chamomile tea has grown cold inside her mug. As my mother taught me, White Elephant things have their own stories. 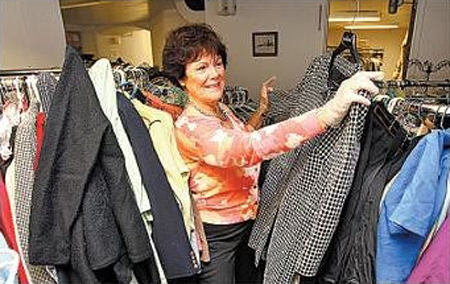 Buying at the sale combines thrift with helping an old church stay afloat. She also trained her four children to get a thrill from noticing something cool that everyone else has missed. She asked me to come to the linens department to look at a rug she found. There, on the floor, were two hook rugs that people ignored. They were walking all over what would be some of our prizes from the sale. My sister was excited about the rectangle one with red cherries. I picked the one with a frog catching a pink dragonfly on its tongue. It's now clean and covering a mismatched seam on the plain carpet of my bedroom. That Saturday afternoon after the sale, we stashed our rugs and everything else in the car, then reviewed our shopping coups from a window table at a restaurant down the block. My sister laughed about her new lacy sundress with wee dangling bananas and apples sewn across the chest. A friend who came with us—finally, after much badgering by me—was surprised that the sale lived up to my hype. She found a pair of calf-hugging patent leather boots from Italy and a down Juicy Couture jacket. My mother was there, too. She wouldn't know how much was made for a couple days until the department tallies would be counted. She always likes to beat her numbers from the year before. It turned out she did. Her department made $700. Her best so far. To church leaders, the White Elephant is an elephantine thing of the past. Filling basement rooms with stuff all year long seems a waste when those rooms can be renovated and might attract paying business renters who could do better than sale revenue, which last year grossed $14,000, a little more than a month's $10,000 heating bill. For me, it’s about more than the needless things I buy. When I moved back to Buffalo eight years ago, the sale led to my first new friend. One of the small army of long time sale organizers told me a co-worker was a regular. When I brought up the sale in the office, the colleague gasped. We talked about the White Elephant clothes we loved and wore. She has a weakness for vintage Lily Pulitzer dresses. The preppy ones with pink and green flowers and frogs. I am a sucker for coats, I told her. Over the years, it was a marvel to me how the old-fashioned sale trundled on and kept delivering white elephants, even as the congregation evolved. The church I knew as a teenage member of the youth group was mostly Waspy and preppy. Now it was attracting a new, urban mix of people. Still, the sale went on. And for this final weekend, I expect the White Elephant will be fertile ground. It's the last chance for me and my friends to play our version of Church Sale Monopoly. I've always been in a minor competition to match the victories of my mother, or at least win her easy admiration, for the way I, like her, can spot old, odd, beautiful things in need of a good washing, being taken in a size, polishing, restringing, rewiring, framing or refinishing. My competition is good natured. Others can be fierce. Once, two couples fought over a prized 1920s-era deck chair made of some fine wood, maybe teak. Their bitter spat led to hushed advice not to mention it at a dinner party days later. My mother says that with the sale ending, it feels like part of her is dying. She says she will lose a community of shoppers and friends, some who have been coming together at the sale, as she has, for a quarter century. And, I've been thinking of all my things. I now like these White Elephant stories even better than the things. But the sale hours fly by and vanish. Things last. Like my White Elephant sale dessert glasses. For more than a decade, I have been serving ice cream in that set with nicks and chips that must have led the original owner to give them away. I hadn't noticed them at the sale until my mother picked one up to show me that in spite of the imperfections, they were gorgeous. Every so often, when I serve my mother ice cream in one of them, her spoon approaches its target, and stops mid flight. She pauses to admire the crystal dish, etched with tulips and leaves and a long teardrop of an air bubble in the stem. "Where does that come from?" she asks. I give her a victorious look before I answer. She knows what I'm about to say.